Admit it, sometimes your jewelry box can look like the kitchen “junk drawer”. Twisted chains, old, snarled herringbone bracelets, missing earring mates. Some of the pieces may have gemstones and diamonds, others are so old-fashion looking – you would never wear them again, but they do have special meanings. These are the perfect pieces to recycle into something fabulous! Something that takes those memories, and displays them into your story. Take this custom ring, for instance. 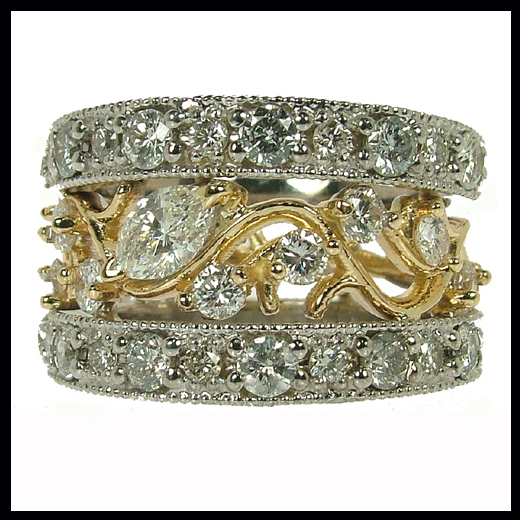 It began as her mother-in-law’s wedding ring, a cocktail ring from her own mom and small diamond stud earrings given to the customer on one of their early wedding anniversaries. The bigger diamond was even her original engagement ring. All beautiful stones, but lost in the jumble of the jewelry box. Scott worked with the couple to discover her style and how she wanted to wear this new custom design. It turns out, Diane is a nurse and she didn’t want to keep ripping her gloves on prongs. Solution: Sides that protect the prongs, and a more streamlined look. She also wanted to be able to wear this ring every day, it needed to be sturdy. By using CAD (computer aided design)technology, Scott was able to show Diane 3D pictures of several designs from many angles. He then made a polymer model of the ring, painted it the correct colors and placed it on her hand with her diamonds. That way, she could see in real life how big this ring was and how it would look on her finger. We then casted the custom ring, set the diamonds and presented her with the new piece. Even better, all of the old gold was recycled and the cost was credited towards the new ring. The result: A beautiful, affordable right hand ring that Diane proudly wears every day!